Jesse Meraz, Parfum, edition of 100, 2015. Courtesy of Ro2 Art. Jesse Meraz, Fauxxboutin, Multimedia, 2015. Courtesy Ro2 Art. With no trace of subtlety, Jesse Meraz calls attention to the fashion industry’s modes of marketing and appeal in HAUTE FAUXX. For the exhibition Meraz, a University of North Texas graduate and current Fort Worth resident, staged the launch of a luxury brand, complete with celebrity-endorsed perfume. 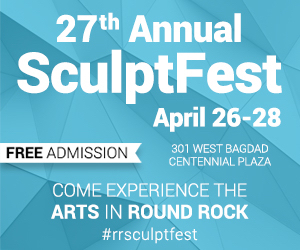 Meraz has exhibited extensively throughout Texas, including at The McKinney Avenue Contemporary in Dallas, Blue Star Contemporary in San Antonio, and Inman Gallery in Houston. He is a former member of Good/Bad Art Collective in Denton, and a current member of Fort Worth Art Collective. 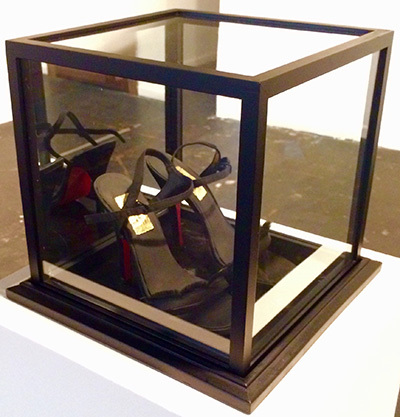 As the art world descended upon Dallas for the 7th annual Dallas Art Fair, Meraz greeted them with a sardonic display concerning the interconnectedness of art and fashion. By employing the usual tropes of the fashion industry—glamour shots, intentionally generic labels and a red carpet backdrop—Meraz revealed the absurdity of it all. He utilized the critical nature of contemporary art to draw a line between art and fashion during a time when the line is becoming increasingly blurred. Although they struggle to fill the space the works in the exhibition are carefully arranged, the glamour shots lining the walls are strategically interrupted by photographs of disembodied wigs, eyelashes, and silicone breasts, always reminding the viewer of the artificial nature of fashion and the exhibition itself. 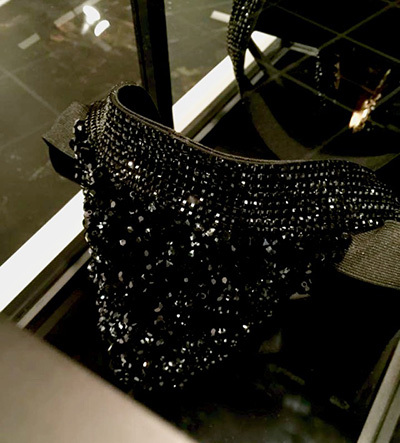 Three glass cases located throughout the gallery house fake luxury items, including Smell My Pretty, a jockstrap adorned with crystals. Jesse Meraz, Smell My Pretty, Multimedia, 2015. Courtesy Ro2 Art. HAUTE FAUXX calls attention to how the fashion industry operates; marketing itself to individuals through the display of flashy goods. However, the success of the exhibition is not necessarily in its ability to label us as victims of that marketing but in its commentary on how and why we buy into, and enable, the industry’s dominance. Meraz’s decision to launch a fake brand in the context of an art exhibition implies a critical awareness of why we choose to purchase luxury goods, art and fashion in equal measure, which portend to offer buyers attributes such as power and social status. The works on display feel overly-manufactured and lifeless, from the design of the perfume label and banal glamour shots to the triteness of the story detailing the fake luxury brand’s supposedly-Parisian origin. 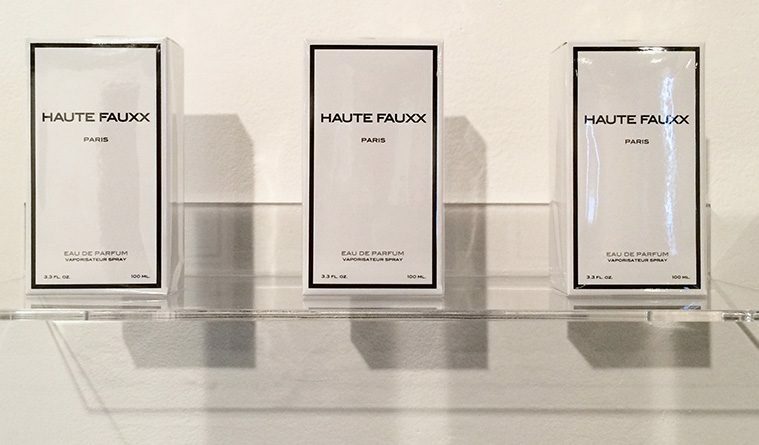 Removed from a gallery setting, it is entirely plausible to imagine the perfume bottles resting on store shelves with inflated price tags and what causes us to reach for that bottle is what Meraz explores in HAUTE FAUXX. HAUTE FAUXX is a continuation of Meraz’s interest in consumerism, and specifically how items we either desire or purchase, affect the politics of identity on a cultural or personal level. What’s revealed is the quest for social standing, and fashion and art’s association with a flashy, high society lifestyle that projects power. While universal in nature, the content of Meraz’s new work is especially poignant in Dallas, a city that has always been associated with loud lifestyles. It’s a place where you find couture next to cowboy, a place in which the well-to-do have immediate access to styles imported from fashion hubs around the globe. HAUTE FAUXX calls for an examination of why and how we participate in an industry that sells products which so blatantly project fantasy. Jeremy Lupe recently earned his MA in Art History from the University of North Texas. He currently works at Dallas Contemporary, and resides in the Fort Worth area.